If you've been browsing anything Montreal wedding related you've likely already seen, and bookmarked the excellent work of my guest for this chat today. I'm really excited to have a discussion with one of the most talented people in the Montreal wedding community today. Planning a wedding can sometimes be overwhelming, at times there may be a million decisions to make, and you'll never be the same after your wedding day, so expectations are high right? Enter Elyna Kudish, top Montreal wedding planner, bringing gorgeous designs and highly personalized service to every event, with lot's and lot's of happy customers :). Our chat will focus on her approach to tailoring her designs to her clients personalities, how she build's trust with her clients, and what she has learnt about wedding planning after celebrating her very own wedding recently. “I like to approach each couple organically..I like to get a feeling for who the couple is, what their personalities are like, what feels most pressing to them”. Micheal - I owe you a huge congratulations Elyna, you recently celebrated your own wedding last year (which looked next level romantic btw) Is there anything you’ve learned about what you do after walking down the aisle for yourself? Has your view and feelings about weddings, or planning/designing changed after this experience? There is no such thing as a "perfect" day. It will be perfect if you let go, let loose, and make the conscious choice to enjoy every moment. The planning and minute coordination only takes us 98% of the way, and mishaps, rips, stains, crying babies, slight delays, etc are completely unavoidable, even with the best rock n'roll team money can by. If you choose to notice everything that's going wrong, you will ruin the wedding day for yourself, and it's a shame, because it goes by quickly, and all you'll remember will be the negative. If you decide to let go and roll with the punches, you will have a phenomenal and most memorable wedding day. It's impossible to preview the shear magic of the design coming to life until it's all setup and put together. Throughout the design process, my clients get to preview various parts (the lighting, the tablecloth, the chair, etc), but it's sooo hard to impart my complete vision to them. As the setup for my own wedding was unfolding (which I was doing myself with my husband-to-be), even my very very trusting fiance had some doubts about certain items. "Are you sure about this colour?" "Isn't it too pink?" "I trust you, but I'm really not sure where this is going..." are some of the things I heard all day, and all I kept saying was "trust me, this is going to be spectacular". People get caught up in the smallest of details, but putting an event together is about the overall look and feel, not about the colour or texture of individual parts. A little bit of faith goes a long way in being able to create a truly magical setting for the wedding. M - Many of my clients are celebrating in a way that is more intimate, the term ‘tiny wedding’ comes to mind - that is to say unique wedding events in much less traditional venues, a much more considered list of guests, certainly less big and extravagant in general. I feel many of my brides are inspired by weddings that feel very authentic to their personalities. Have you had the chance to work on many weddings with much smaller guest lists and if so, as a designer, do you approach these events differently? E - I haven't notice this to be a trend, though I have definitely done a few of these in the past couple of years. Every wedding is an equally exciting adventure for me, so no, I don't tend to approach them differently. 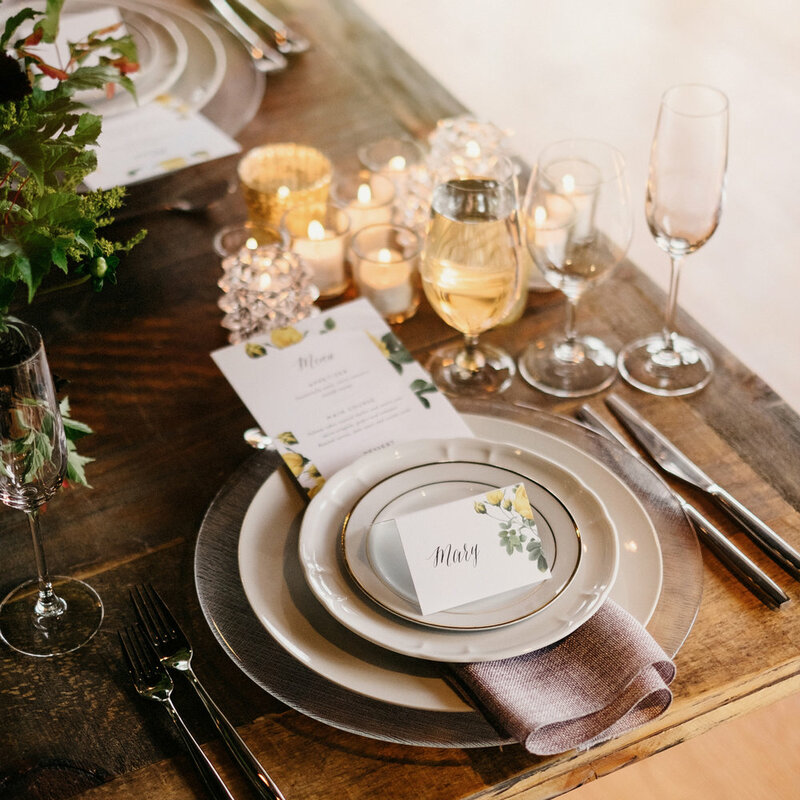 As a planner, the fun is in planning and designing a wedding that is uniquely tailored to the couple, and I'd say the work and approach are the same whether it's a party of 20 or 300. A gorgeous location is guaranteed with Elyna, as seen here at a gorgeous little spot in Parc Jean Drapeau last summer. M - We've worked together often for several years and I’ve had the fantastic opportunity to watch you and your team work many many times. I’m always blown away with your design choices, and very much appreciate your attention to detail. The moving parts of your excellent team are always in control and help smooth out the transitions of the day easily and comfortably. - From the conversations I’ve had with our clients I know they were absolutely blown away with your styling and expertise. It’s clear to me that you are on top of your game, but I want to know - What do you get excited about on the big day? E - to be very honest, the most exciting part of my work is getting to the wedding day. I love getting to know my couples, and bringing their personalities to the forefront of the event. I love the planning, the coming up with a most perfect design, the laying out of a wedding day schedule. the wedding day itself, however, I like to see myself as a brain surgeon. My team and I walk in with high levels of stress, organize, cue, coordinate, manage emergencies, run around, make sure everyone is happy, and essentially don't stop to breathe until it's all over. My favourite part of a wedding day is looking back at 4am and thinking "yeah, that was a great one!" M - What are some of the important questions couples should be asking themselves when beginning to plan their wedding? And, what difference can working with an experienced planner mean for couples looking to design the biggest day of their lives? E - I think the most important question for couples to ask themselves is really what it is about the wedding that is most important and dear to them. There are plenty of blogs and questionnaires out there to help you figure if you're a romantic bride or a rustic one, what your colour palette should be, etc. I tend to approach weddings more organically, it's really all about the love and the guests' experience for me. When working with a planner on the design of their wedding, I think couples benefit most from both our scope of experience and our focus. An experienced planner will know the best techniques to achieve the desired look, focusing the couple on those elements that are most important all while keeping in mind the entire finished look and feel of the event. Elyna's expert use of space and light always creates a very warm, cozy environment, and is very considerate when transforming a space to be both wonderful, and functional. Everything runs very smoothly with the Kudish team at the wheel. M - It seems in many cases a planner is instrumental in helping make critical decisions such as, structuring timeline, ‘day of’ details, vendor contracts, etc. How do you approach working with your clients from the start? Is there anything a couple can do before even reaching out to a event designer? E - It's often better if a couple comes to me with nothing done yet. That being said, most couples come to us with one or two vendors already booked, often the photographer and/or venue. The best thing for a couple to do before reaching out to a planner is to determine what their expectations are in hiring a planner. We all have our strengths and weaknesses, some are better at negotiating prices while others are better at design. I like to approach each couple organically. I have a back-end structure I like to follow, but so much of this work is all about the human contact! I like to get a feeling for who the couple is, what their personalities are like, what feels most pressing to them, how and how often they prefer to communicate, and then we take it from there. M - What do you think about Montreal as a wedding destination? How are we doing / do we have it going on? What would you like to see that perhaps is missing right now from a planners perspective? M - To close this up I want to know what does the wedding of your dreams look like, and where? For now, I am still dreaming about my own actual wedding last November, which was a dreamy eclectic magical voluptuous night. A frame with Elyna herself on her wedding day. Congratulations Elyna :) Photo credit Richard Pham. If you are engaged and looking for an award winning planner based in Montreal planner wedding do visit Elyna's website here - at https://www.elynakudish.com. You'll be in the very best hands. For photography related info, drop me a line here to tell me all about your wedding inspiration and what you are most looking forward to on your wedding day. I have a handful of dates left and would love to hear from you. Below are just a handful of images from weddings Elyna and I have collaborated on recently. You'll notice that guests are always having the best time, and the vibe at all our weddings is so good, it's one reason we love our jobs so much.